One of the problems with tile showers is how to handle the drain. 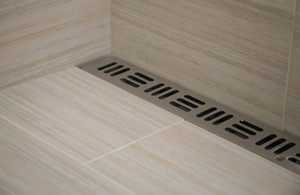 The traditional drain which is centrally located functions well, but often causes problems with tile floors. The current trend towards larger tile has increased this problem. In order to slope the floor to the center drain, the installer generally resorts to multiple cuts creating an odd polygon pattern or worse, the shattered tile look. Alternatively some installers avoid the issue and leave the floor level causing puddles and standing water. A new solution has presented itself with the installation of linear drains such as the FreeStyle Linear Drain by Noble Company. A linear drain is installed along one wall allowing an even cross slope to be installed draining the water to one side. Linear drains have been common in Europe, but have not been easily adapted to U.S. plumbing. Consider this solution when you’re looking at a tile shower. We are professional manufacturer of wedge wire linear drain. 1. A high weight capacity with a high passing ability and warping preventing. 2. Streamlined appearance, unique, a cheerful new look. 3. Compatible range of indoor drainage with a coordinated design. 4. Easy to clean, the water along the channel bottom to outlet. By the way, we can also customize it according to your drawing. If you interested in wedge wire linear, welcome to contact us at any time, quotation will be given according to your update parameters. We are waiting for your early reply! Thank you very much.